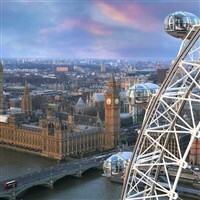 At a height of 135m discover a new way of seeing the nations capital when you take a flight on the London Eye. Add a 40 minute sightseeing Thames river cruise. Our luxury GOLD Coach has unrestricted panoramic views, reading lights, toilet facilities along with just 36 fully reclining soft leather seats with over 50% more legroom than a standard coach. Stretch out and relax! London Eye discover a new way of seeing the nations capital when you take a flight on the London Eye. The height of the London Eye is 135m (equivalent to 64 red telephone boxes piled on top of each other) making it the fourth tallest structure in London after the BT Tower, Tower 42 and One Canada Square in Canary Wharf. Already offering unrivalled views of London, the bespoke cinematic addition to the Coca-Cola London Eye provides another magical and entertaining way to experience our capital city, further enhancing the value and the experience of a trip to the UKs top paid for visitor attraction. The 4D Cinema Experience is included. The perfect prelude to an experience on the Coca-Cola London Eye, the new 4D Experience is a groundbreaking 3D film with spectacular in-theatre effects including wind, bubbles and mist to add a breathtaking fourth dimension. River Cruises depart every 30 mins. Vouchers will be supplied to passengers who buy the River cruise package. Vouchers may be used on any departure throughout the day. Enjoy a unique 40 minute circular sightseeing cruise on the river Thames with fascinating live commentary presented by trained guides. Highlights include the Houses of Parliament, St. Paul's Cathedral and the Tower of London. Suitable in all weather as the boat has covered and sun deck seating and is fully wheelchair accessible. Toilets are available onboard. Arrive directly in Front of the Eye and River Cruise boats depart from directly under the London Eye. Child under 4: free entry to attraction - only pay for seat on coach. Worle-Preanes Green Bus Stop Worle Preanes Green, New Bristol Rd. Registered in England No. 3635902. © 2016 Bakers Dolphin. All rights reserved.